When Mom died back in March something withered in me too. For the first time since my culinary curiosity sparked in 1978, I lost interest in food, in cooking, in writing—blogging too. I still enjoyed the table, sharing a good meal with family and friends, but I took no pleasure in dreaming up a dish, shopping for it, cooking it—and certainly not writing about it. I can’t completely blame Mom’s death for my dramatic change. Our family has experienced many of life’s big events this year. Dashiell Collins Keet’s big splash into our world (literally into a birthing pool!) on January 16th impacted this family more than we could have ever imagined. Before Dashiell was born, Maggy and I would talk about my role in his life. “I want to be his grandmother, not his nanny,” I insisted. Yet as I watched Maggy struggle with returning to work, not wanting to leave her son, it didn’t take long for me to decide that I wanted to be Dashiell’s full-time GoGo. With Maggy, Andy, and Dashiell living with us on Maggy’s maternity leave, David’s and my winter and spring were rich and full. But just as they were moving back to New York, we got word that Sharon had landed a job as the development director at WhyHunger in New York City. Not only would Sharon, Anthony and our little grand French bulldog Eloise be moving back to the area, but into our home as they settled in and figured out where they want to live. Clearly, this is a season for family. Last Saturday while Anthony & Sharon and Maggy & Andy made dinner for us all, David and I took Dashiell and Eloise on a walk. It wasn’t long before Dashiell tired of the stroller and Eloise went on a walking strike. As the four of us traipsed back home—Dashiell in my arms and David pushing Eloise in the stroller—I realized that this was good enough. It need not get any better. Maybe it’s not that I’ve lost interest in food as much as my priorities have further pivoted. Family has always been important, but never so much as now. The family says I’ve changed. Maybe. All I know is that food and drink mostly serve one purpose: to bring my family together. 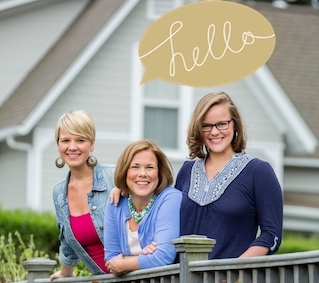 Maggy, Sharon, and I have enjoyed our little blogging sabbatical. We’ve rediscovered what we love about food blogging, so going forward there will be no more posting just to produce regular content. If we’ve got something worth sharing we’ll let you know. You may hear from us less frequently, but we will do it more joyfully. Peanut Butter and Jam Bars perfectly exemplifies the kind of recipe we want to share. With our annual Anderson family reunion getting close, we wanted to create something to share as we gather around the table and trade tales of all that’s happened since we last got together. In that family spirit, we offer it to you. Adjust oven rack to lower-middle position and heat oven to 350 degrees. Line a greased 13- by 9-inch baking pan with a 13- by 18-inch sheet of parchment to facilitate removal of baked bars. Grease and flour parchment and set aside. Mix flour, salt, and baking soda in a medium bowl and set aside. Beat coconut oil and sugar until smooth; beat in egg, then peanut butter, and finally the vanilla extract until smooth. Reduce mixer speed to low, add flour mixture, and beat until fully incorporated. Thanks for sharing all this, Pam. I am so grateful for your HONESTY … in all your books as well as on this blog. My family would tell you in a heartbeat that I am the biggest Pam Anderson fan out there. And one of the things I love and admire about you is that you were always willing to choose what was best for YOU … even though at times that meant taking a step back from what surely would have been great fame (because you are one talented lady!). But you do all this with such grace and with the understanding that just because a change in rhythm is right for you, it doesn’t mean it would be right for everyone. The point is this: I respect you; I am grateful for you; my family’s bellies are grateful for you. So thanks! Thanks for sharing your gift and for sharing your heart. Yay! Great attitude about blogging. 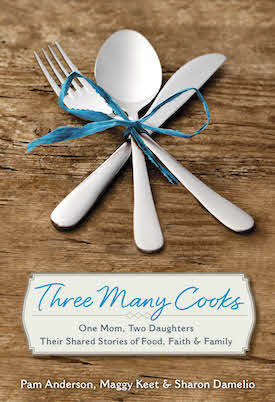 I for one enjoy your three voices and stories as well as the recipes, and I would much rather wait a while for something that sparks your joy. This recipe reminds me of a wonderful family vacation to North Carolina when my sister-in-law and almost 3 year old son baked up peanut butter and jelly bars for the whole gang. Thanks for the memory awakening, and thanks for keeping the blog in the honest voices of the Three Many Cooks. And the crumble topping looks fantastic! I just recently discovered your site, and while I’m sad to hear you’ll have less frequent posts, you don’t know how much this post struck a cord with me. An aspiring writer/blogger myself, I found my whole world turned upside down after the birth of my first daughter. Just when I found a new routine that allowed me time to write, I gave birth to my second daughter (who is now a year old). You hit the nail on the head for me with this post, and I’m oh so thankful for your words. Welcome back ladies! I really enjoy your blog and fab recipes but I’m happy that you’ll be spending more time enjoying life and your family. Thank you for another way to eat PB! Beautifully written post, Pam… Thank you for sharing! With baby #2 on the way in a week or two, I can relate to your shift in priorities. I’ve taken a similar turn with my blog, and it’s quite freeing. While I haven’t had the time or energy to do a lot lately, I enjoy developing recipes and writing so much more when I don’t feel obligated to do it. If these peanut butter and jam bars are any indication, I think you’re on the right track. I can’t wait to give them a try! Love your honesty! And your fans will enjoy your posts joyfully, no matter how often they are!! Keep up the good work GoGo and girls!! I too applaud your honesty! Even though your family says you have changed, maybe you just changed your priorities at this time in your life. When my mom died, my life underwent changes I had not planned previously. My first grandchild was going to be born 6 hours away. There are transition times in life that we do not plan. Enjoy the moments that mean the most to you right now! I am so sorry about your mom. I missed your posts. Take care! Congratulations to you and your family, becoming a grandmother is definitely life changing. You are my kind of gal, family first, and then life flows from them. I missed your posts, was a little worried about you and I’m glad your back. So enjoy your family and post when you can, we all will be patiently waiting. Just want to say of the top that your books and blog have been an inspiration. How To Cook Without a Book saved my life. Thank you for sharing your journey with family and food. It has been an inspiration. Will miss y’all bunches. Sometimes we just have to rethink our situation. Personally I understand. We have a son in law a navy aviator who will deploy July 25th to part unknown. Our daughter and grandson will be with us for a while. Jouious Blessings to all. Isn’t it “grand” to be a grandparent??? Life does change when those little darlings come along. It just gets better. There is just no way to explain how your world expands (and your heart) with the arrival of a grandchild or three! Life is good. Enjoy you little one. Pam, thank you for a great bar recipe that is sure to become a regular sighting in our peanut butter loving home. My sincere condolences for the loss of your mother. I recently lost a sister and through the loss I have also gained a clarity about what is truly important in life. I wish you and your family the best, and please know that like the other comments here, I will be looking forward to seeing future posts from you, knowing that they are truly joyful posts from your heart. thanks SO much for sharing. I’ve missed you – but thankful you have family and prioritized how I would. Our lives are in chapters – blessings on your current chapter – and hope you share with us soon. All the best – and God’s blessing.